Lili Reinhart and Camila Mendes have an important message to share with their fans about body image. Just weeks ago, Reinhart and Mendes took to social media to call out Cosmopolitan Philippines for photoshopping their bodies. 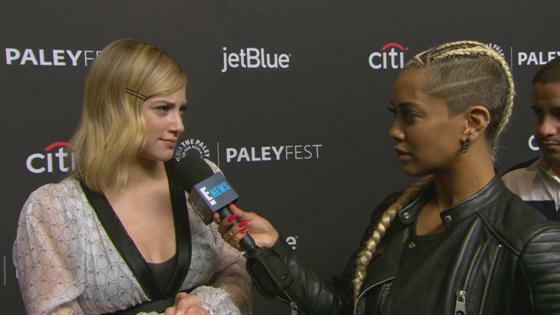 On Sunday, the Riverdale co-stars attended the CW show's panel at PaleyFest in Los Angeles and revealed why they decided to speak up about the photoshopped images. Mendes shared with E! News' Sibley Scoles that the minute she saw the images, she took a screenshot and sent it to Reinhart. They then decided that they needed to say something. "It came so naturally for us, it almost wasn't a second thought," Mendes said Sunday. "How could you not say something about that?" "I just didn't want other people to think that was my body," she continued. "That's just a personal thing too because sometimes you hear about people who aren't comfortable showing their bodies on screen and so they have somebody else be their body double and stuff...no matter what I would never feel comfortable with that even if their body is like 10 times skinnier or more fit, whatever. It doesn't matter, my body is my body and I want people to know that this face goes with this body." After seeing the images Mendes sent her, Reinhart told Scoles she was "appalled" by the photoshopping. "I just felt the need to speak up about it because I feel like I talk about everything else very openly," the actress shared. "As women and even men we struggle with our bodies every day when we look in the mirror and especially when you're put in the spotlight and people critique your outfits, your skin, your body, your hair, whatever...I'm still...it's a battle for me every day to accept what I am and my flaws and know that you know I can't change certain parts about me and that's fine." Reinhart continued, "I'm presenting myself to the world as I am and so for someone to photoshop that is just insulting and it's just like don't try to put me into a box that you think I should fit in. That's just not gonna happen." Watch the video above to see the Riverdale stars talk to us about body image and more!